This elegant valance with sash and buttons can be adapted to fit various window widths. The pattern makes a valance that is 42” finished width. The finished length of the valance is approximately 20 inches at the center and approximately 25 inches at the sides. 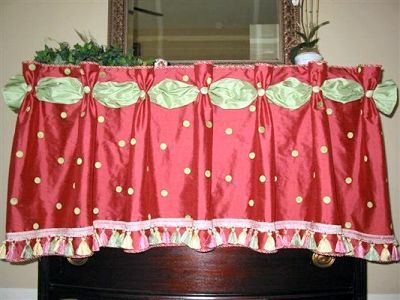 This valance works best when constructed out of a medium to heavyweight decorative fabric for the face fabric. We recommend a lightweight fabric for the sash. The valance has a slightly shaped bottom with facings at the top and bottom. The valance mounts to a 1 x 6” or 1" x 4” dust board. A small piping is applied to the top and bottom of the valance. We also applied a decorative trim along the bottom of the valance. These amounts are for a valance measuring 42” wide finished. See chart below for other window widths. These amounts are based on 54” wide fabric. Allow extra fabric to match patterns and plaids.